Out in the embroidery world lately, there’s been a lot of talk about thread conditioners and about beeswax. The topic surfaced when Thread Heaven – a silicon-based “thread conditioner” – went out of production, and since then, I’ve read and heard a lot of talk on thread conditioning for embroidery. And I’ve received a lot of questions in the old inbox! So, today, I’m going to address a couple points addressing thread “conditioning” and the use of beeswax in embroidery. Before we start, if this is the first time you’ve ever heard the term “thread conditioner” and the subject has never been of concern or interest for you, don’t be lead astray by the fact that I’m bringing up the topic. In most cases, thread “conditioning” is not essential, practical, necessary, or even good for embroidery. Coating a thread with a “conditioner” is a relatively new thing in needlework. The idea behind Thread Heaven was that it helped make difficult threads easier to stitch with, by coating them to straighten them, to keep them from tangling, to make them a little smoother, to keep them from fraying, kinking, and so forth. In the embroidery world – and especially in the area of conservation – the use of silicon-based conditioners is a matter for more research and discussion. Among the professionals I’ve discussed the topic with in the industry – from conservators to manufacturers – silicon-based conditioners, over time, seem to have a negative impact on threads, especially those made from natural fibers. It would be interesting to see some controlled experiments on the topic. The notion seems to be that coating a thread with silicon doesn’t allow the natural fibers to “breathe” the way they normally would and tends to trap any moisture content or anything else in the thread that would normally dissipate or fluctuate over time, in different environmental conditions. Logically speaking, a thread should not need a “conditioner” to make it work. Think about it. A smart thread manufacturer wouldn’t create a thread and market it, knowing that a “third party app” – a thread conditioner – is the only thing that will make the thread behave well enough to stitch with it without frustration. Such an approach would indicate really bad manufacturing and marketing practices, wouldn’t it? It would also indicate a lack of real thread and stitching knowledge – which would then beg the question: why is that person in the thread manufacturing business in the first place? If it’s the case that a thread does not work satisfactorily without coating it with some kind of conditioner, then the flaw is in the thread – either in the manufacturing process (in the twist or the tension placed on the thread while its being manufactured) or in the fiber content of the thread. However, beeswax is another story! Beeswax has been used for centuries to coat threads – but only in particular circumstances. By beeswax, I mean 100% beeswax, not a beeswax substitute, and not beeswax mixed with paraffin (which makes the wax flaky and can cause a real mess on your needlework). The yellow wafer of “beeswax” in the clear plastic slotted containers that you find in most sewing stores on the notion wall is not always 100% beeswax – check the label. If you want 100% beeswax, you normally need to find it somewhere besides the notion wall of the chain fabric store. Beeswax is used in embroidery, but only in certain circumstances, and all those circumstances have to do with strengthening and protecting the thread. So, in goldwork, beeswax is used to coat the thread before using it to sew the real metal threads onto the fabric. Coating a silk or even synthetic thread with beeswax protects the thread from abrasion by the metal threads. Beeswax is used to coat threads to strengthen them in other circumstances, too. For example, when attaching objects like buttons or similar things to fabric, coating the thread with beeswax will strengthen the thread against normal wear and tear, so that the buttons – or beads or other objects – are held to the fabric more securely, hopefully for a longer period of time. Beeswax does not have a negative impact on threads, as far as conservation goes. I’ve got pieces of embroidery in my collection that are hundreds of years old. The threads on them that are coated in beeswax are strong and sure, just as they were when first used. And my pieces have not been stored in any conservation-friendly environment over the years, either. They’ve come from attics and forgotten boxes! So, beeswax has a good record, and it is often used to strengthen and protect threads used in particular types of embroidery. Beeswax for Purely Decorative Embroidery? Once Thread Heaven disappeared from the market, a flurry of advice went around, contending that embroidery threads – and I mean the threads used to create decorative stitches, not the threads used to affix other things to fabric – could be coated with beeswax instead, to help improve the threads and the stitching experience. If you coat your threads with beeswax (or anything, really) it changes the look and performance of the thread, and it changes the stitching experience, too. For one thing, threads that are coated in beeswax darken over time. They darken right away, actually, but over time, they tend to get even darker. Threads that are coated with beeswax don’t perform the same way as uncoated threads. They don’t have the same “spread” or the same “spring.” They don’t reflect light the same way. When you coat a thread, you interfere with the thread’s normal properties. Remember, those normal properties are probably the reason you chose that particular thread! We choose a thread because it’s pretty, because it reflect light a certain way, because it’s soft, because it has a particular twist to it. All of these things are altered when you coat a thread, even if it’s with beeswax. You shouldn’t need to coat decorative embroidery threads with anything. If you do need to, to make the thread work, then there’s a flaw in the thread. Especially when it comes to natural fibers (cotton, silk, wool), you shouldn’t coat decorative embroidery threads with anything. The exception? 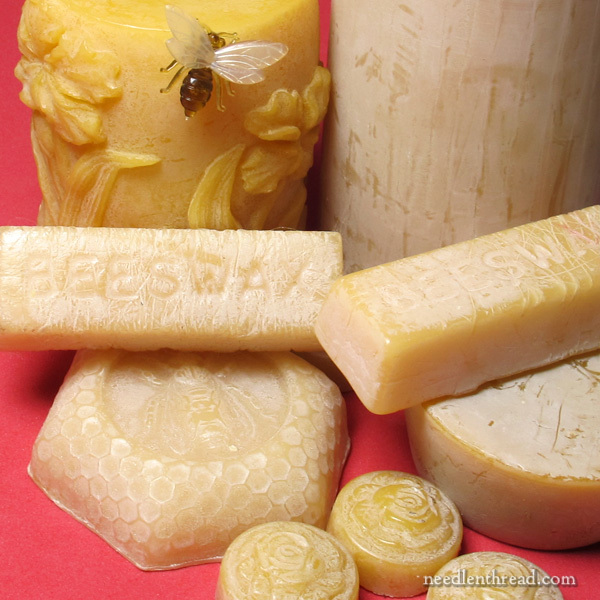 Beeswax for strength and protection against abrasion. But not for decorative work! As always, I’d love to hear your take! Feel free to weigh in on the subject below – or ask any questions, or share any insights! Thank you, Mary! Your explanation is so logical. I always feared that thread conditioners would be tacky, causing dust or grime to stick. That was always my worry too. I’ve never used any. So if Thread Heaven makes DMC floss much more cooperative, that means DMC makes bad floss? I’ve never found a natural fiber that’s well made to be non-cooperative. No problems with DMC floss, personally. But if you’re having problems with it, often it has to do with the needle size or even the fabric (polyesters and polyester blends are harder on natural fibers). Well, I’ve recently been having a lot of problem with DMC floss and used Thread Heaven to deal it. But after recently reading several opinions on the needle quality of a lot of the available needles out there, I don’t think that floss is the problem. I think the problem is my needles. So I bought some Bohnin needles and I see a marked difference in the results. The cheap needles I had that were made in China are the problem. There are burrs in the eyes! So I will be going through what I have and throwing out a bunch of my needles. I think a lot of those who “need” something to make a thread or floss more cooperative are cutting floss too long — longer than the 18” recommended for most brands. Longer threads are more prone to tangle and to suffer abrasion wear before you get to the end, as well as being more subject to soiling. Ask me how I know. Fully agree with all that you say. Throw out anything that is not pure beeswax, and only use it for goldwork or attaching buttons. I have stitched a lot with the so called difficult threads : DMC light effects, Kreinik and the rayon “silks” and have never once needed anything else but letting go of the needle to make the thread behave when it’s being difficult. Snarls and snags seem to happen when I forget to drop the needle frequently enough to let things unwind. The box of Thread Heaven I was gifted many years ago was used once and put away – it did not do anything to the thread that I liked – it just made it “sticky”. Ugh. Thank you Mary! I’ve long been a proponent of NOT using thread conditioners, except in the circumstances you mentioned. And have encountered some negativity as a result. Stitchers seem especially fond of using conditioners on metallics, when it really isn’t necessary at all. Thanks for your wonderful explanation. Thank you for talking about the effects of beeswax on thread. I have some beautiful chunks of beeswax in the shape of roses but I have never used them on thread. I just consider them a “pretty” in my sewing room. I love the “spread”of threads and would never want to interfere with the natural thread properties! If we have any vegan stitchers out there, they might object to the use of beeswax. Anne – I (not a vegan) think it has to do with not wanting to use any animal products, or exploit the animals and their products. What the animals make should be used by the animals or their young themselves. As in the milk should be for the calf, the honey for the bees, etc. Also, while most of us know about factory farms for meat, milk & eggs, I don’t think it’s widely known that truckloads of bees are shipped around the country following crops in bloom, so some might consider that a form of factory farming. You have certainly made me think before I reach for my TC. I am doing a project right now using DMC thread (one strand) on 100% polyester dinner napkins. It’s not something I expect to end up anywhere but on the table and then in the washing machine, dryer and linen closet – IOW, I really want the recipient to feel like she can actually use them! As I sewed on these napkins, I became very conscious of how hard they were on the floss. When I used my Thread Heaven the thread passed through the fabric with less resistance, pull and “drag”. (I know y’all know what I mean – it even sounds less rough.) The Thread Heaven greatly reduced the amount of fraying along the length of each strand. In this case, I think the fault is in the fabric; not the thread. When I tried out the pattern on a 100% cotton fat quarter, the thread had no problem. Thanks, Mary. I am so grateful for your knowledge and willingness to share it. Yes, you’re right. Polyester fabrics are harder on natural fibers. Since this is an item that will be washed, will not that remove the thread conditioner? I plan on stitching on some napkins. I would really like to know if the conditioner will wash out. Thus far, I have never used conditioner, because I have forced hot air heat, very dusty. And I thought any conditioner would be a magnet for the fine dust. I have poly-cotton pillowcases Mom embroidered with cotton floss. After a number of years the fabric cut the floss and the work is gone 🙁 I also have decades old cotton pillowcases (well-used and laundered from the looks of the fabric) and the cotton floss embroidery is still in great shape. @ Alice – Thread Heaven is silicon – which is usually water-repellant, if not waterproof. So it’ll be a while, and a few washings, at least, before it’s gone. Beeswax will mostly wash out with hot water, but it may also melt into the fabric around the embroidery 🙁 . Batik-workers usually, I think, iron the dyed fabric over cloth or newspaper, to melt the wax out cleanly. And you’re right, beeswax _is_ a dust-magnet, kinda like if you’ve ever left a candle out all summer? No idea about Thread Heaven there; I’ve never used it. I believe Thread Magic has replace Thread Heaven? Not promoting silicon over beeswax just a comment. Thank you for this article. I have used both Thread Heaven and now have Thread Magic, the new silicon based thread conditioner, but I have wondered about the long term effects. It’s like using Frixion pens and then ironing them off. The chemicals stay in the fabric and occasionally it will leave a shadow mark on your fabric. I do have 100% beeswax and guess I will stick with it. Thanks ago for this food for thought. Mary, I tried using Thread Heaven years ago and I did not see any difference in the way that the thread performed when I stitched through linen. I usually use DMC thread and I like the way that thread feels…and with Thread Heaven on the threads they felt, well, funny…not slick…just funny! So I stopped using Thread Heaven and I figured that I wasn’t using the Thread Heaven properly! I enjoyed reading your “you don’t need thread conditioner” logic this morning because it explained why I didn’t need to use the Thread Heaven! Thanks for reinforcing my decision! Hi. I agree. I have only used beeswax to coat thread when doing goldwork, traditional hand sewn buttonholes and hand quilting. Not machine as it would gunge it up. I did once coatsome pure silk thread in beeswax as I was doing some fine macrame for s project and as the silk threads were slippery it helped to hold it all together. That was an experimental piece though. Mary–as always a very interesting discussion. I didn’t realize Thread Heaven was used in embroidery–obviously I haven’t been keeping up. I do mostly beading at present. I’ve used lot of Thread Heaven & something called micro….? wax. (I don’t recall the exact name) However, I never thought of using it in embroidery but only in beading (on nylon thread). I’ve been told that it strengthens the thread. I don’t know if you have any thoughts on that?? Of course, when using crystals and some metal beads, even this wouldn’t stop them from cutting the thread and I use a fishing line that I wouldn’t otherwise use. I do recall when I used to do goldwork years ago (before Thread Heaven existed) it was always recommended to use beeswax when attaching metal purl etc. I was requested to purchase bees wax for a project from a British on line class, so I did. I used it but it has been put away since. I do not particularly care for it. What I use all the time is having a wet and squeezed ball of cotton on which to run my thread for embroidery. It does help immensely and I do like it. To date I have not seen any discoloring of threads nor disintegration of them. The only embroidery thread that even tempted me to consider some type of coating was the rayon floss that my mother selected for decorative embroidery on a mixed fabric crazy top. The results looked pretty good but I quickly learned to use shorter lengths to minimize ‘hairiness’. This was about forty years ago and I knew of nothing but bees’ wax which would have altered the shininess Mom wanted. Thanks for your knowledge on coating threads. I am a newcomer to ecclesiastical embroidery. Due partly to my daughter getting ordained 5 years ago and now my son is in training to become a priest. I love your site and it’s reviews are really useful (I am awaiting my slate frame, legs and needle minders when the Canadian company who have come to the UK are up and running. I placed my orders after reading your reviews.). I hope everything is going well with you and looking forward to my next Needlenthread email. God bless you and keep you well. Maureen. Thank-you for the interesting article on using thread conditioners. It has come at a very appropriate time for me. I did use some on the BOM that I am doing, but have not in the last little while. Now I am glad that I stopped. Over 50 years ago when I was introduced to needlework, my Nonny gave me a beeswax candle as part of my supplies. I used beeswax until I learned about thread conditioner. Guess I am going back to beeswax. I use beeswax to coat my thread in goldwork but that is the only time I use any kind of thread conditioner. I’ve not heard of using thread conditioner on embroidery before and I think thread especially natural fibres is fine without it and I would agree you don’t need to coat decorative embroidery threads. Thanks for sharing your views with us on thread conditioner great article and even greater tips for us. You have probably commented on floss wet by sponge. I saw your comment about thread conditioner vs. beeswax and if and when to use. I am inquiring about almost dry sponge to straighten floss. What is your comment about that. Thank you for your help. Yes – it works and is especially helpful for synthetics. Just let the thread dry first before using it. Excellent article, Mary, and I could not agree with you more! In my opinion, the demise of Thread Heaven is actually a good thing! I would rather spend my money on better quality threads that will behave well, or a class with a knowlegable and experienced embroidery who will teach me about the nature and properities of thread, than on silicon thread conditioners. Apart for being better for the thread (imho) knowing how to get the best out of a thread has not only improved my stitching but also increases the pleasure I get from embroidery. Your discussion is right to the point! and correct. The only excuse for using anything on your threads, specifically silk, is that the tread is being used to couch a metal thread or braid. Then the thread needs to match or blend with the metal unless the pattern calls for contrast. If you are having difficulty managing a thread, you probably need to choose a different thread or brand of similar color. In some cases with threads stored on cards, you might want to consider having a moistened cotton pad at hand to dampen the thread just enough to get rid of the kinks. Have several working lengths at hand so they can dry before use but just dampen them so they dry fast. Try a very small plastic box with a damp sponge in it. I love my sponge box for this. The only thread “conditioner” I’ve found handy is plain water, and then only for rayon threads. I’ve found dampening these threads, especially Marlitt, helps unkink and control them. I’ve even stitched with them very slightly damp and it’s helped a lot. Good afternoon, Mary, and “Thank you” for this very interesting and informative article. I have used neither Thread Heaven, nor beeswax, on my threads, but I have recently been wondering if maybe I should. Thanks to your timely advice I need wonder no more and save my pennies for more glorious threads. I derive enormous pleasure and knowledge from your marvellous web pages and, as ever, am most grateful to you for them. Thank you for this clarification. I have in my sewing box my great grandmother”s well worn piece of beeswax…probably at least 50 years young. I’ve always used it to sew on utilitarian buttons as she taught me but lately, wondering if I was making a mistake not using it with my cotton embroidery floss. It certainly didn’t seem as if it were a good idea. So now, thanks to you, I won’t give it another thought! Thread heaven was originally formulated for beadwork. It was a result of a collaboration with a bead worker and a chemist. I had a long phone conversation with the owner right after they announced they were discontinuing the product. She told me it was too complicated to sell off the formula due to ownership rights, so she decided to shut it down. A week or so later, the fires hit the Santa Rosa area pretty hard (the location of her core business, Adam Beadworks) so it became even more difficult to find out what was going on. It appears the threadheaven.com website has been dismantled. oh sorry – correction required! – I do NOT use thread heaven for buttons! I meant to say that about beeswax! I am so glad you said this about bees wax and any coating! I have never used anything but have also heard from others it helps to keep the threads from knotting up. All you need to do is drop your thread and needle every 4 or 5 stitches. At first it seems to take thought, after a while it is second nature and this keeps your thread from twisting. This was you will not use any coating on yu work. I hope this will get others thinking about the usage and damage coatings cause. I use this ‘let it hang’ when I’m knitting too. Just hold onto the ball of yarn and let the knitting hang. Excellent information! Thanks for sharing. I totally agree with Mary on this subject. I have never used a thread conditioner when stitching in my ‘pieces’ and not even when sewing on a button; I mean like, how long does it take to replace a button or a snap. Having never made any goldwork embroidery I can’t speak to that however I believe that just to add strength and abrasion resistance I’d consider it and probably for a lengthy time before proceeding. So there is my opinion. Wonderfully presented article Mary, thank you so much for bringing this up. Woo-hoo! I’ve always not used bees wax or silicone on threads. Thank you for verifying my gut reaction to the conditioners! I just didn’t like the way they made the thread behave. Wonderful article. I used to use bees wax to help ease my thread’s way when hand quilting. Since I generally quilted using an off white, I never really noticed a significant change in colour but did find that it helped ease the thread’s passage through all of those layers. Whilst I did enjoy using it for hand quilting, I never even thought of using it for my embroidery work. How about wool thread’s? Have you heard of its use for crewel or wool tapestry work? Beeswax or thread conditioner would both change the whole feel and effect of wool. I wouldn’t use either on wool – or any natural fiber, really (except in the case of doing goldwork, which isn’t normally done with wool). embroidery threads. Could you give a couple of examples for the two?, i.e. abrasive situation, what to look for…….thanks…. Metal and sharp things can be abrasive, meaning they rub the thread – or the thread rubs on it – Causing the thread to break down. Decorative means purely decorative Stitchery that doesn’t have the purposes of stitching any metal or sharp thing to the fabric. I use 100% bees wax only for applique. I have notice that when stitching my pieces, they tend to stay put longer, and I have pieces that didn’t hold when I forgot to use bees wax. I do edge turn applique. I use it on cotton thread when I sew. I have never use it on embroidery thread, and I thank you for this article, that I did something right. I find if you pull embroidery thread hold up the needle and let the thread spin to it natural, before knotting it, I get limited tangles and fraying. Plus always limit the length of thread helps too. Thank you for your articles, I love them and always learn from them. I recently had a terrible time with a “high quality” thread and linen in a cross-stitch project. I tried both thread conditioner and beeswax. Then the owner of the shop I go to suggested it was how I made my stitches, up and down, that twisted my floss and caused the tangling. I had never heard of this nor could I figure out how to stitch differently. I don’t do a lot of cross stitch so I just suffered through. Any thoughts? You might try dropping your thread and needle towards the floor every four or five stitches to keep the thread from twisting on itself. If you turn the needle about a quarter way against the thread twist when you stitch – if you habitually turn the needle and cause the thread to twist further – then that can solve the problem, too. I have bought a kit for a stumpwork experiment and was advised by the designer to use beeswax with the thread used to cover and fix the wire on the fabric! Could I go without ? (Even if I did purchase the beeswax from Bonin). The thread in question is DMC. Thanks in advance for your advise! Enjoy the week. It depends on the wire, to what extent it is abrasive and cause damage to the thread. Practice or test it and see what you think! Thank you, thank you, thank you for standing up for “thread rights’. The idea of “thread conditioner” always seemed pointless to me and I never used it. I do use beeswax for some beadwork although some of the newer threads for beading don’t need beeswax. And as someone else mentioned, I control rayon threads by pulling them over a damp piece of felt. Wonderful article today. I so completely agree. I tried Thread Heaven once because it was recommended at a workshop. Boy was that a mistake, I hated the change it made to the thread as well as the extra unnecessary step. I tossed mine. Thanks for suggestion regarding bees wax and when to use it. Woo hoo! Wow, Mary all that you just said sums up my thoughts on and approach to “coating threads” for decorative work. Thank you for putting it into words so well. I did not read any other comments before posting mine. Spontaneous “Woo Hoo”s are impressive! Thank you for this information. I’ve been doing some redwork recently and the dmc thread quality is inconsistent. Thank you Mary! I have read from so blogs that you need to use Thread Heaven. I have found that when I have the correct needle size and thread size for a project things flow very smoothly without the thread conditioner. I have used thread heaven and beeswax and never saw the benefit to my problem with knots and tangled threads. I can’t thank you enough for your articles on threads, needles, etc. Once I got that information my embroidery began to go much better. They have been such a blessing to me in my embroidery journey. My grandmother taught me how to embroider a very long time ago. After I retired I picked up embroidery again and use it in my art quilts. Your videos are my go to reference. Thank you for sharing your knowledge with us. A small correction to using beeswax when doing gold work. The ONLY thread which is run through beeswax is the silk couching thread, never any silk floss, only the sewing silk typically used for couching Japanese metal, attaching bullions, spangles. The beeswax not only strengthens the sewing silk but helps from being abraded or even cut by the sharp edges of metals. Hi, Marylyn – thatnks for your comment. I’m pretty sure what the article says? I’m right there with you on the limb with regards to thread conditioning. The less we do to our materials, the better. Thank you for a great read. I totally agree with you, I am not in favour of any coating on my threads. If I am going to put the work in to an embroidery I don’t want the thought……will this disinter great down the track if I coat my threads with some form of conditioner. Thank you for a very informative explanation. Confirmed everything I already believed! I typically only use beeswax when I’m attaching something. I believe if you can’t get a thread to behave, then your needle is wrong in some way, too many or too few strands for the ground fabric or selected stitch and maybe you haven’t developed the skill level yet. Thanks Mary for clarifying this. I was feeling quite concerned about not having access to something like Thread Heaven even though I actually haven’t found that I use it very much. You are such an excellent resource and well respected in the larger Embroidery Community. As a costumer for Theater productions, the only time I use beeswax, and I agree it has to be 100% beeswax, is when sewing up buttons. Any embroidery done uses quality floss as it comes. Embroidery floss does not need thread conditioner of any kind. One thing I’ve done with cotton threads that are colorfast, is to run them quickly over a damp sponge – it’s like you “ironed” the thread and it pulls through your fabric much more smoothly. It doesn’t coat the thread with anything. But it does tamp down the fibers along the thread that might “catch” on the fabric. This only works with color-safe threads, of course. Man, I hadn’t even heard about Thread Heaven. I’d use it on Nymo for beading and I think the real problem was that I was too lazy to want to end my threads as often as I should so the thread I’d stitch with would be too long, but a lot of the time the Thread Heaven didn’t seem to help much. Now there’s Fireline (though I can’t use it all the time). As for embroidery, what you say makes a lot of sense. I’d never even thought of using it on embroidery thread. You article makes sense to me. I’ve been embroidering for 50 years, I love floss etc. Keep threads out of direct sunlight is one rule for me. I was trained at the Royal School of Needlework to use beeswax as a conditioner for gold work sewing threads, beading threads and some threads used in finishing construction work. My adage has always been: if it is good enough for the Queen, it is good enough for me! Thank you for your comments regarding so called thread conditioners. I’ve always been scared of them but didn’t know enough to argue the point. The only time I use it is with gold work. I’ve had teachers give it to me in classes and I acted like I was doing it but didn’t. That was easier than arguing over it. I use a little water to straighten floss and help make individual strands lay side by side for smocking. I haven’t noticed any problems with that. I’ve never used anything but beeswax, and admit I didn’t exactly know what the likes of Thread Heaven were until this article, so thank you! I use the beeswax in goldwork, as you have said. I wouldn’t think of using it in other forms of embroidery, though I do use it a little just on the tip when threading a number 12 needle, as it makes it a lot easier. Not all colours need this, as not all colours ‘fluff’ as quickly as others. But some I found it were a necessity! I then cut the tip off and out of the way. It should also be noted that if you do use beeswax, you need to apply it to your thread away from your fabric, as it will mark your fabric badly if it does spread to your fabric in the process of applying it. Thank you Mary. I have always felt inexperienced when I questioned the logic behind needing to coat a thread to enhance its performance. I would have changed the thread, the fabric or the needle, so thanks for a bit of insight from someone who actually knows something! If threads don’t ‘lie’ properly or knot it’s often the fault of the’stitcher’. Stranded embroidery often lies best it separated out, especially when using 2 or 3 threads, threading the needles using the opposite end to the cut end also seems to help. Bees wax is a natural substance. How is the silicon conditioner delivered…..is it a spray….hummm, we have enough of those already! Hi, Ann – the silicon isn’t actually a spray. It’s usually in a little box, and it sort of resembles and feels like a kind of rubberized gel. Agree wholeheartedly. My mother was a qualified tailor who had a huge wad of beeswax that she ran threads through when she wanted strength. She never used it on embroidery or fine materials. How interesting that this article appeared in Needles n’ Thread today. I am working on a practice sampler and was having problems threading my needles. I found an article that said using beeswax would help to stiffen thread for threading. So I was looking for 100% beeswax. Thank you for clearing this up. I will work on threading my needles without the extra help of beeswax. I had only ever used beeswax or whatever substitute (I got mine from my mother, so I have no idea what my round thing is actually made of) when doing hand sewing – if I had trouble threading my needle for sewing buttons, hemming pants, repairing small rips, etc. I had never considered using a conditioner for embroidery since I had assumed it would leave my thread feeling tacky – not something I wanted. Glad to hear my instincts were correct. Thanks, Mary – your blog is always so informative! I think you mean silicone (a manufactured sealant compound) not silicon (a naturally occurring element – a metalloid). I find any type of rayon fibers difficult to work with, but I love the look once they are incorporated in a project. I have found passing the fibers through a sponge, lightly dampened with water, becomes an instant fix. I also keep the tail trimmed as I work. I have use beeswax when couch in gold work, and almost always with attaching beads. Wow, what interesting information! Thank you so much. I never liked Thread Heaven, but have sometimes used beeswax to provent kinking. Perhaps I just need to use shorter threads. Well Mary, I will fess up and admit that when I saw here on your website that thread Heaven was no longer being manufactured, I quickly hopped over to a big box store’s website and ordered four of them! I still have one from the last 2 years, but I don’t want to run out. Let me point out, though, that I do not use it for embroidery of any kind. I do a Lot of handstitching (pant hems, skirt hems, etc.) and I use it for that. I wouldn’t use it on embroidery, it ruins the appearance of the threads. This article has provoked quite a Response! I was introduced to the idea of a cotton ‘sponge’ to straighten threads during a lesson on using Marlit threads. The teacher suggested an empty film container, the type that held 35 mm film cartridges. It works well for a stitching session but the cotton sponge should be allowed to dry out after the session. An Rx pill bottle would work as well. Yes, dampening the thread can help calm it if need be! Very informative, authoritative, useful, and well written. Nice job Mary. And that’s why I always check with you when I want to know or learn more about embroidery. Thank you! When I was a teen, I was taught by my grandmother to use beeswax when sewing on metal shank buttons – the heavy buttons on overcoats or heavy jackets. Nowadays I have a few different spools of heavy button thread in neutral colors and black. I still occasionally have to sew on a coat button but I use button thread sans beeswax. I haven’t used beeswax in years, and never on my embroidery. But oddly enough, I still have it in my sewing box. After reading your article, I wonder what on earth I’d ever use it for? The one exception I might make is for smocking, especially when doing picture smocking. I have also used starch, which is more labor intensive when you have to iron it, but the goal is to get the threads to skick together and create almost a flat ribbon appearance. When I am trying to fill in something it helps the strands act uniformly and less likely to twist and separate. But I could concur with Mary because that has to more with the worthiness of my stitching skill than the worthiness of the thread! I have only used beeswax. My grandmother kept bees when I was small and still have a small glob of her wax. I have even used it on wool and silk but only on the 1/2 inch I am trying to get through the needle’s eye and only when it is particularly fuzzy and cutting that 1/2 inch off doesn’t help. Some days are just like that. Maybe static electricity. I used bees wax but only on candlewicking thread which was white thread on a white background and mostly French knots and a little satin stitch in the design. Completed the pillow top 30+ years ago and it still looks beautiful. It was for my mom when she was redoing her living room sofa. I still use beewax for metal threads, mainly on the ends to stop the fraying, but I do think that for other fibers, one shouldn’t use anything other than water for control. Mary, thanks for the interesting article regarding the use of conditioners used on embroidery cottons, wool or silk. I have been taught to use a damp sponge on my silk and rayon threads should I struggle to sew with it. What is your opinion about that? Yes! Just don’t stitch while they’re still damp – but it’s a good way to calm a thread if need be! Mary, do you recall reading/hearing anything about ear spoons? They are (were) used by embroiderers to harvest their own ear wax to use for conditioning threads. If you can get past the ick factor, I suppose it isn’t much different fron beeswax. Ear spoons were a common tool in Palais Royale boxes. Thank you for this information Mary, wouldn’t have known this at all. Thank you so much for this piece on coating thread. I have really wondered. When thread heaven went off the market I searched out a back up container. But you are so right the only time I really had to use it to stitch at all was with two particular specialty threads. I had already decided the hassle of using those threads was not worth it and made substitutions. I felt kind of bad about buying them though but now after reading your article not so bad. In the future I’ll try to curb my excitement when I see new types of thread and try out one skein before making a bigger selection. In my experience the trouble makers are rayon and Threads with shiny strands twisted in. I am so glad that you addressed this issue. I myself have never used any conditioners on my threads, and if anything ever got wonky with the thread that I was stitching with, I merely worked with it, and figured a different way the next time to stitch with it better. I do have Thread Heaven in my stash, in the event of “if I need it”. Thank goodness I never gave into the temptation to use it. And after reading your post, I never will. If anything, I might throw it away. If the young girls and women who stitched with the threads back then never used such a thing, then there is no reason for me to. I “might” be tempted to use beeswax, just for the tips of the threads when threading the needle…sometimes it gets annoying when I wet the ends and they still won’t go through. But until I buy beeswax, I’ll just be wetting the ends. And for what it’s worth, I love your posts. So informative! I did wonder if you ever discussed another thread discussion that I’ve seen. Whether to bobbinate or bag or both for thread storage. What is your opinion on that? Till the next post, stay well and warm! What if you are having a problem with the ‘tail’ of the embroidery thread fuzzing out or unraveling…..could you use bees wax just at the end of the thread to keep it under control? You could always not use the very end that is ‘treated’, I don’t want to alter the thread’s normal properties. Also, I bought metallic thread and I think I WILL use the 100% beeswax on that as I have a difficult time with it splitting and breaking even using shorter pieces at a time. Thanks so much Mary for your Magazine and the chance for us to weigh in and to ask questions! You are helping Millions of us!! You should snip the tail when it becomes fuzzy. Otherwise, it’ll leave fuzz in your fabric when you stitch. Thanks for a great explanation of when to use beeswax. I frequently do goldwork & have always used it to strengthen my couching threads. That is the only time I ever use anything to coat a thread. Like several others who commented I was given a sample of Thread Heaven years ago, tried it, and immediately tossed it in the drawer. I recently ran across it & threw it out along with the rest of those so-called helpful items my non-stitching friends have given me over the years. I used to have a very small machine embroidery business (doing one-of-a-kind custom work only). I always had trouble stitching with metallic machine embroidery thread and my dealer suggested using one of the silicone thread conditioner products. It really helped but at a huge price. I stitched the names and date in metallic threads for a custom photo album a friend was making; she embellished the silk with silk ribbon embroidery. The silicone in the thread conditioner stained the silk around the machine embroidery and was impossible to remove without ruining the fabric and embroidery (both machine and ribbon). We had to remake the project from scratch. I would never ever use anything like that again. Very interesting article on thread coating. I did have an issue with thread fraying while working embroidery on 100% good cotton. I had a cube of “Thread Haven”, used it but the thread still frayed. Next I changes my needle size essentially creating a larger hole for the thread to pass and solved the problem. Also I believe it is important to not use old floss, when I purchased floss I dated it, if it’s still around after three years—it’s gone. If I purchased a kit with “Craftway” floss It’s is immediately replaced with DMC. Very interesting article. Do you use beeswax when you attach beads to your embroidery pieces? It really depends on the bead, Jean. For most seed beads and delicas, no. But if it’s a heavier bead or a bugle bead, I do< depending on the bead itself. I use both Thread Heaven and Thread Magic when hand sewing. I have use both for embroidery, especially when my thread keeps fraying or when using threads with metallic fibers ( which I think is some sort of plastic). I am working on a project now that is using a sewing thread that has a metallic wrapped around it giving it a two tone effect and it just doesn’t want to go thru the fabric with out shredding off the metallic. Using a large needle helps but not enough so I am using Thread Magic. I also have beeswax but I was taught to run your thread thru it and then press if between two layers of paper. This does really work for sewing thread but I have never used it for floss. It is good to know that it may not harm the piece. Now I will be stuck as to how to use some of these fancier threads like DMC Light Effects or Satin. a very informative article. I have beeswax but I never use it on my embroidery threads. In the NEEDLEPOINT world we have been taught never to use wax on the threads!!!!! We used the little blue box for beading thread ONLY. Now we have been using just bees wax for attaching beading, since it does help with knots in long pieces of threads. that is using beading thread !!!!!!! I LOVE reading your blog. It is interesting, informative and ‘direct’. You don’t allow the ‘greed’ of companies to influence your opinion. You appear to be only interested in educating your readers and in this day and age that is a rare thing. Thank You. Thanks as usual for stating all the facts and researching everything so thoroughly! Is the fault with the thread, or with manufacturers & suppliers of “difficult” threads not making it well-known that the product needs special handling? It seems like many of the difficulties can be addressed by using shorter lengths, paying attention to twists that develop as you work, needle type/size, even ground fabric used. I know the first time I used a specialty thread, I had no instructions on how best to handle it, so I did as I had been for years with cotton floss. I swore off all but cotton threads for years because of the grief I had. It wasn’t until internet access was widely available that I saw advice to use shorter lengths and the stabbing method of stitching that I tried the fancy threads again. I did not even think to look at the package of beeswax I bought at chain store if it was 100% wax. Then again, I use it only for sewing, not needlework. So far. After years of just running the thread through the beeswax and immediately sewing on buttons, I’ve seen that you are supposed to iron the threads so the wax is melted into the thread. Apparently this often missed step makes thread even stronger since the wax goes into the thread not just on the thread. Is ironing the wax into the needlework threads recommended as well? Well, now this is very, very interesting. Learn something every day. Thanks Gail. Such an interesting topic, and this was very informative Mary. Thank you. I’ve never really used this sort of thing, but do happen to have some of that “Large chain store” stuff. LOL. I think I’ve used it once or 2ce, and didn’t really see any improvement to stitching, nor any reason to continue to use it. Now I know I won’t be using anything like this in the future, as I rather wondered about it’s long term effects. Thank you again, your knowledge and information are always so very helpful. I use Thread Heaven to prevent fraying, BUT, I only use it on about 1″ of the end of the thread where it goes through the needle. Since that part ends up trimmed and discarded, it doesnt affect the parts that are actually in the design. I find this a very good compromise for me. Thanks for clearing this subject up for me. Did not know the company had gone out of business, had used it years ago. But had not seen it in the stores for a long time, and was wandering about it. I am very glad to find out we don’t need to use anything on our thread. Thank you so much for your article on Bees wax. Like many people who pick up on an old and much loved skill,(summers spent sitting on a porch swing with my Granny embroidering tea towels and pillow cases) after retirement and find themselves, really interested in the tools,designing their own, the process etc. I have been much interested in the references to using BeesWax . Your article was a great help, and I was pleased to find I had come to about the same conclusions. Thanks so much for this site, I use your tutorials, articles etc. alot. I know it takes time away from the stitching……………. P.S By the way, thanks to you I have a new love in my life, a laying tool..
Chiming in late…I started using thread conditioner when I did a lot of beadwork. I used beeswax for that. I don’t believe Thread Heaven existed at the time. Then I started using Thread Heaven for counted cross because the Aidia cloth, even though you are going through the holes seemed to shred the embroidery threads no matter how short I kept the thread. As I normally buy kits this could be because the send inexpensive and poor quality floss. I find conditioning the thread helps it slide through the material much easier. I’ve always felt that a little wet sponge takes the wrinkles out of thread just fine. And if you eschew bobbins for threads you won’t get so many wrinkles anyway. Those bobbins just seem made for hard wrinkles. Very well written and just the endorsement to not use conditioners, as I thought! Made me think of folks who want to glue their work together as part of finishing. Thank you! I liked the 100% pure beeswax suggested use for beads/button embellishments tho – answered that question as well! Here, here…it’s great someone finally took the time to say this. The only time I use beeswax on my thread is very limited. Limited to the end I thread the needle. I only wax about an inch of the thread and that is cut off when I finish stitching and anchoring the thread. I always wax my threading end for Au Ver a Soie’s Soie de Paris, because the ends just “boing apart”, making it difficult to re-thread. For beadweaving, I use microcrystalline wax to help strengthen and detangle the mostly synthetic threads. Many thanks for making a good blog site that teaches a lot! While the entire article does make sense to me, there is still one situation I’m not certain about and that is the issue of using metallic threads. Often, the metallic thread will pull off the thread it’s held to and the whole thing can sometimes be tricky to use and to thread needles with. I had read that this can be alleviated by using a thread conditioner. With metallics, use very short strands, use a needle that is larger than you think it should be – large enough to create a hole for the thread to pass through with the least abrasion. I think chenille needles work best, when embroidering with metallics. Today I found a small box in an antique shop in a small market town. Inside were several very very old pieces of beeswax. Cut and ridged over time. There was a slightly rusted needle stock into a cork, and a few balls of silk thread. My grandmother was a seamstress. This was not a box of contents, it was a repository of nostalgia in shades of honey and pink.